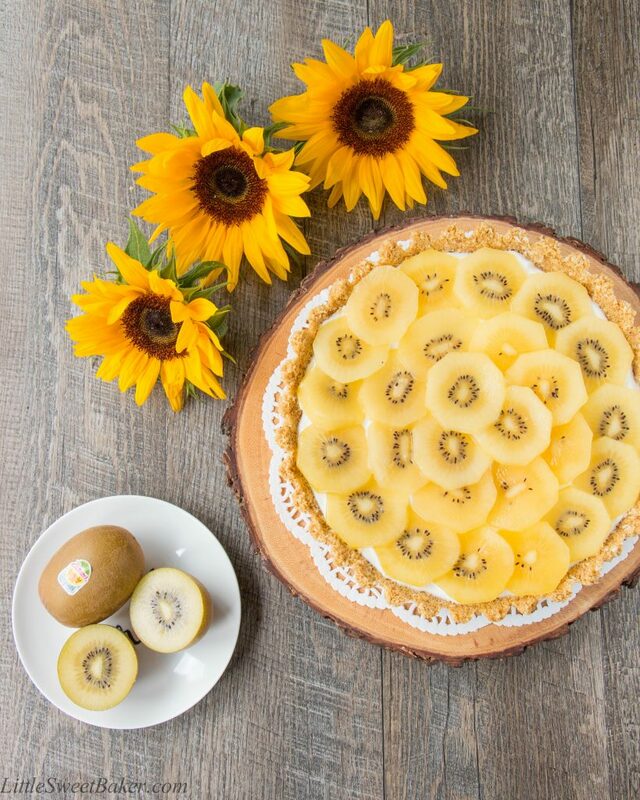 This healthy no-bake treat is made up of a coconut hazelnut cookie crust, a creamy Greek yogurt filling, and it’s topped with delicious golden kiwifruit. It’s one of the most tasty, healthy and easy desserts you’ll ever make. This is a sponsored post. 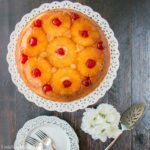 I had the wonderful opportunity to work Zespri SunGold Kiwifruit with the to create this recipe for you. Though monetary compensation was received, all opinions are my own. Well, we’re only at the end of our second week of summer vacation, and I think I already have gotten too much sun. The kids have been busy with swim lessons and exploring the outside of our lake house. It’s been fun, but it’s been hot, hot, hot! Hence, another no-bake recipe. Not that I’m complaining about the heat, since summer is so short here in Ontario. 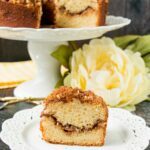 This recipe begins with some shredded coconut mixed with some chopped hazelnuts and graham cracker crumbs. Then I simply spread on some thick vanilla flavored Greek yogurt as the filling, and topped it with some beautiful sliced golden kiwifruit. I chose to go with a yogurt filling instead of your typical custard because I didn’t wanted to have to fuss with cooking and cooling. The Greek yogurt is thick enough to be able to slice and serve the tart nicely. It’s creamy and flavorful, and much healthier than a custard filling. Then I finished the tart with some fresh ripe golden kiwifruit. 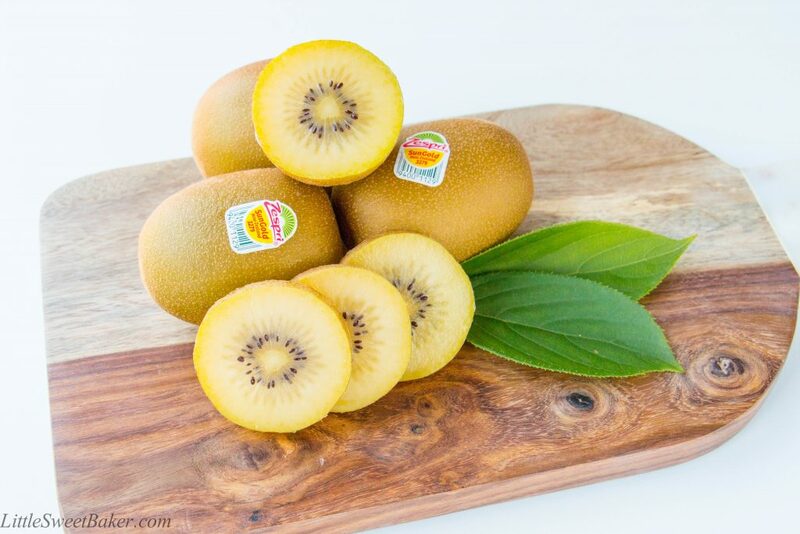 Golden kiwifruit is one of my favorite types of fruit. It’s much sweeter than the green kiwi, and it tastes like a cross between a mango and a strawberry. 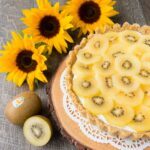 I had the wonderful opportunity to team up Zespri Kiwifruit to bring you this lovely, and perfect-for-summer recipe. Kiwifruit makes a great snack anytime of day. You just cut the fruit in half, scoop and enjoy! The taste is fresh, juicy, and naturally sweet. Kiwifruit is also super healthy. It has more than 3 times the amount of vitamin C found in oranges, and contains as much potassium as a medium banana. Two kiwifruits also contain as much fibre as bowl of bran flakes. 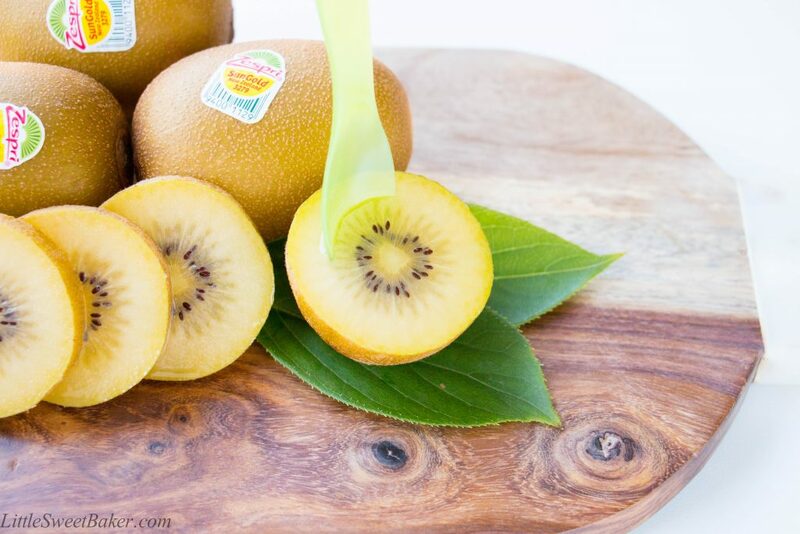 You can find Zespri SunGold Kiwifruit at your local supermarkets from May to October. So, if you have yet tried this awesome fruit, make sure you pick some up the next time you go grocery shopping. 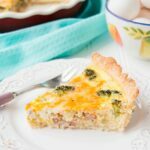 The taste of this tart is fresh, fruity, cool and creamy, with a crumbly tropical-flavored cookie crust. It’s a delicious dessert that won’t affect your waistline. 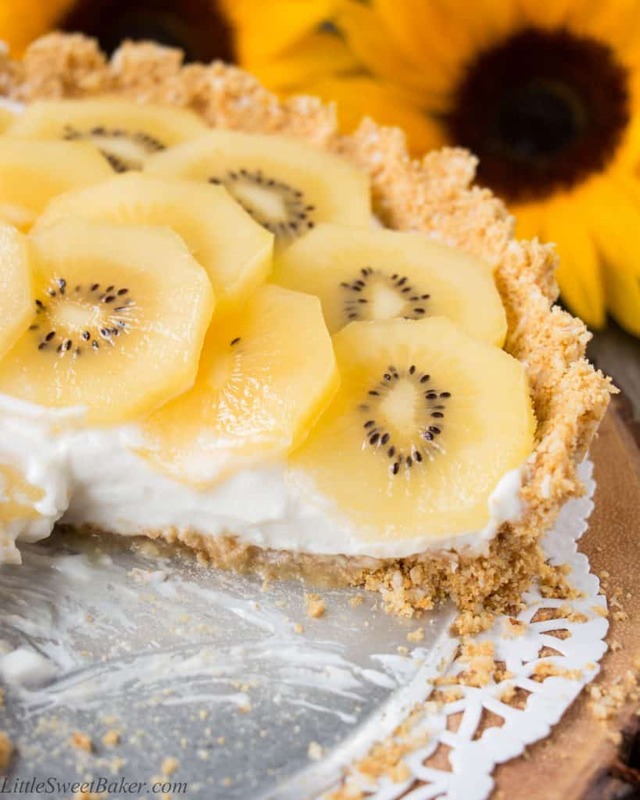 This healthy no-bake treat is made up of a coconut hazelnut cookie crust, a creamy Greek yogurt filling, and it’s topped with delicious golden kiwis. Mix the first 4 ingredients and press onto a 9″ tart pan with removable bottom. Chill in freezer for 20 minutes. Spread the yogurt on top and decorate with sliced kiwis. The crust can be prepared ahead of time and stored in the freezer. 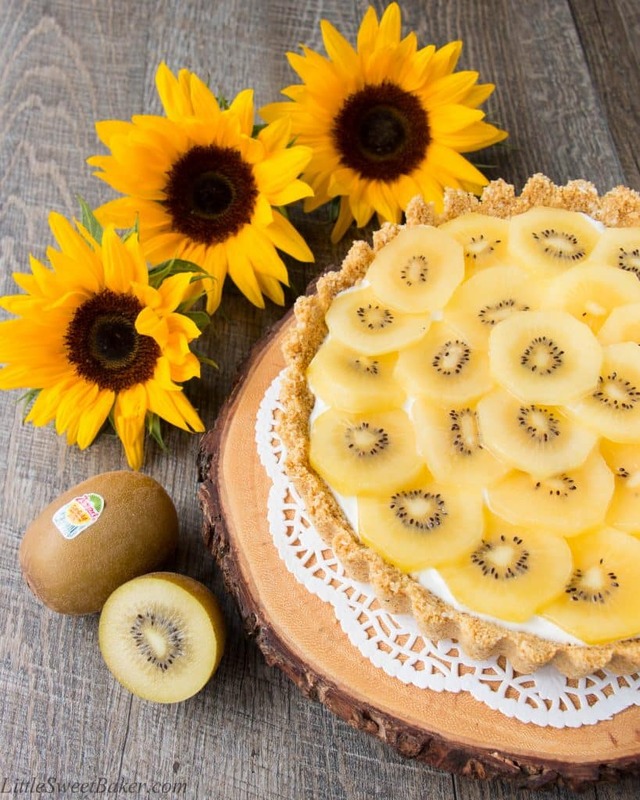 The yogurt and kiwi should be prepared just before serving to prevent the crust from getting soggy, and the fruit from releasing its natural juices. I baked this tart earlier today to try it out and I love it! It is not only healthy but it is also not that heavy on the stomach so I can eat more than one piece. Thank you! Gold kiwi are unknown to me but i will be looking for them. This is my kind of dessert Lily! Gorgeous photography. I have never seen golden kiwis before. 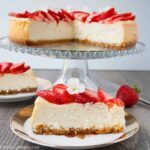 This dessert looks beautiful and delicious! And with the Greek yogurt, it sounds like it is also quite healthy! Soo quick and healthy! Yellow kiwis are such a beautiful fruit! We have kiwi which have green flesh – never heard of this variety. I wonder if they taste the same – looks delicious regardless. This tart looks delicious! I’ve never heard of golden kiwi. I’ll have to look for them! Thanks and you have to give them a try. They are much sweeter and less acidic than the green ones. This looks so pretty! We just finished a box of golden kiwis. My daughter would love this!